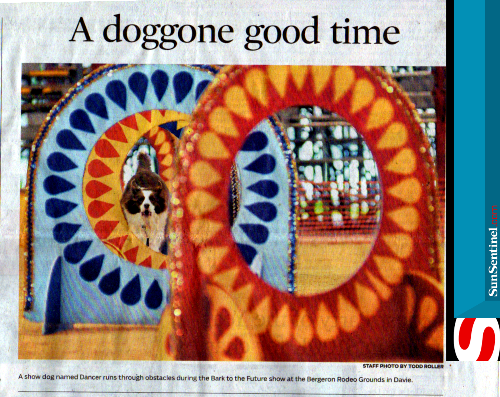 Residents enjoyed a variety of canine-related fun during the recent Bark to the Future show at the Bergeron Rodeo Grounds in Davie. Dan Ratay, show producer and founder of American Idogs, described the show as a mix of “America’s Got Talent” and “Dancing with the Stars” with a hint of Cirque du Soleil and the Harlem Globetrotters. The event also included a pet expo and an adoption fair, and part of the proceeds benefited rescue organizations. Among the more than 20 four-legged performers was Ratay’s dog Shadow. She was rescued three years ago after getting hit by a car and abandoned on a busy intersection in Miami. About 70 percent of the dogs in the performances are rescues, Ratay said. “America’s Got Talent” 2013 semifinalist Kelsey Huxford, 18, and her dancing dog Bailey were also part of the entertainment. Daniel De La Rosa is show coordinator and the vice president and director of training for Service Dogs 4 Servicemen, one of the event’s beneficiaries. Sara Donadei-Blood, president of the organization, founded Service Dogs 4 Servicemen as a tribute to her grandfather, a World War II veteran. He adopted two racing greyhounds, which ended up assisting him in different ways, like guiding him up and down stairs. Festivities also included a sheepherding demo with border collies and a Dotson race. Among those enjoying the event was the Penuela family. They took in a dog that had pups and kept some. Renna and Joey’s children, Angie and Jordan, were chosen to participate in one of the shows. “It’s a win-win because it draws awareness to the dog organizations and it’s an event for families to [enjoy],” Joey Penuela said. A TIGRESS THAT DOES WOUF WOUF! We also have a Dancer with a two inch long eye lash, a Hendrix that doesn’t play guitar and a funny Moose in our dog entertainment show. Davie, Fl, December 18, 2013: They jump higher! They run Faster, They are Funny and Spontaneous! They are the American Idogs National Performance Team and are coming to Davie Bergeron Rodeo Grounds, on Saturday December 28th, for two presentations of the ‘’Bark to the Future’’ show, hosted by Service dogs 4 Servicemen, an organization that is rescuing racing Greyhounds and retraining them to become service dogs for Veterans with PTSD, along with several other rescue organizations. Guest star AMERICA’S GOT TALENT 2013 semi finalist Kelsey and Bailey will also be a part of this special presentation. First show is at 11:30 a.m. and the second will be at 2:30 p.m. Up to $5.00 per ticket bought, from participating rescue organizations, is returned to help them with their fundraising efforts. Doors open at 10 a.m. until 5 p.m.
Two (2) – 75 minute Bark to the Future shows and Big Pet Adoption Day with vendors on site. In addition, the program offers a unique Sheep Herding Demonstration by the Amazing Craig Malloch Border Collies. Several conferences by pet professionals and Wiener Dog Racing event are added bonuses on the program. The right place to be, with the entire family, just between the 2 major holidays. Take a bit of America’s Got Talent, a slice of Dancing with the Stars, a drop of Cirque du Soleil, and a pinch of the Harlem Globetrotters…Stir it up with lots of love and enjoy! It’s like an American Idol and America’s got talent for dogs! Did we mention that 70% of our stars are rescue dogs? Our dogs set a great example for those kind-hearted souls interested in adopting a rescue. From the dog’s creation to the Egyptians, with a stop at today’s courier Doglympics and a pit stop at Nascar racing, these shows are suspenseful, dramatic, exciting, and funny. The upbeat music, special effects, and non-stop action will keep you laughing and cheering throughout the entire show. American Idogs is wholesome family fun for kids of all ages, from Puppies to Great-Grandpaws! Your Mummy will love it too! Meet the Stars after every show to get their “Pawtograph”. A press conference will be held Friday afternoon December 27th at 1p.m. at Bergeron Rodeo Grounds in Davie to meet AGT Kelsey and Bailey, Tigress, Boom, Dancer, Shadow, our unique Moose plus 14 other furry stars! There are no “stupid” pet tricks here: This dog show presents canines of the most talented order, some of them nationally televised. 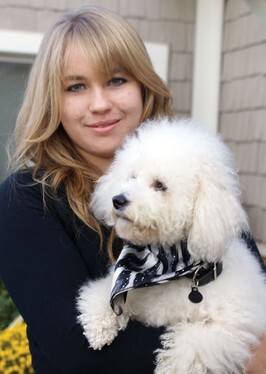 Owner Kelsey and her beloved bichon Bailey, fresh from the 2013 quarterfinals of “America’s Got Talent,” are among the scheduled performers for this nationally recognized pooch production courtesy of American Idog. Among the other running, jumping, high-fiving dogs include a team of racing Dachsunds and a sheep-herding border collie. The event also functions as a dog expo, a pet adoption day and a fundraiser for local rescue organizations and shelters. America’s Got Talent taped a show recently in the area but Saturday was the day for local dog’s to shine and show their talents. 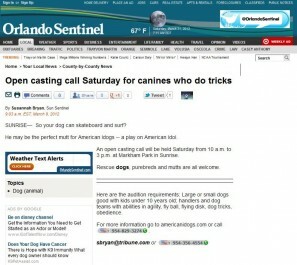 At Saturday’s Pawfest in Largo Central Park, dogs could audition for American IDogs. Currently American IDogs has 13 dogs and the touring company hopes to expand to 75 dogs for its upcoming “Bark to our Future” production. It’s the American Idol and America’s Got Talent for dogs. The canines dance, jump, do tricks and show off their obedience training, according to organizers. About 70 percent of the dogs in the show are rescue dogs. The show focuses on “what is best in pet ownership- responsible owners and well-educated dogs,” said show producer Daniel Ratay. Early Saturday afternoon an Australian Shepherd from Pinellas Park warmed up before the auditions started. Cayenne walked through the agility course with Owner/Handler Kelly Hansen. Then the shepherd sailed through the tunnels and jumps with ease on her own. PRESS RELEASE FOR IMMEDIATE RELEASE Contact: Dan Ratay Show producer Office: 954-829-3274 www.americanidogs.com Open casting. Calling all dogs in the state of Florida! 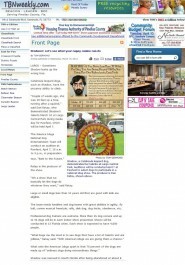 Hollywood, FL March 7th, 2012 – They run faster! They jump higher! They are funny! They are spontaneous! sometimes unpredictable and soon to be the most popular dogs in America. They are your AMERICAN IDOGS! 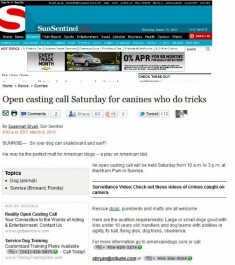 And they want your dogs to audition for the BIGGEST DOG FAMILY ENTERTAINMENT SHOW IN AMERICA! 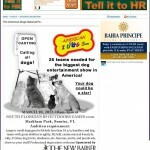 Audition will be held at two major Florida pet events sponsored by The NEWBARKER MAGAZINE. “We are glad to announce that on March 10th from 10 a.m. – 3 p.m. the American Idogs National dog entertainment team will do their first audition at the South Florida K9 outdoor games at Markham park in Sunrise city Fl and on April 7th from 10 a.m. -3 p.m. at the Largo Paw fest 2012 in Largo Fl in preparation of their National show tour ‘’Bark to the future” Audition requirement: Large or small dogs less than 10 y/o that are good with kids. We need handlers and dog teams with great abilities in agility, Fly ball, canine musical freestyle, rally, Disk dog, dog tricks, obedience, etc. Rescues, mutts cute or not and purebreds, show us your stuff! Professional dog trainers welcome! The Recipe for an American Idogs Show: Take a bit of the American Idol and America’s got talent tours, a slice of Dancing with the Stars, a drop of Disney on Ice, and a pinch of the Harlem Globetrotters. Stir it up with lots of dogs, love and enjoy! More than 25 dog owner and up to 45 dogs will be in each indoor show presented. 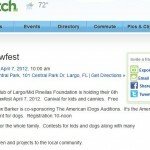 “A press conference has been organized by the Kiwanis Club of Largo for the official launch of Paw fest 2012 and the first official audition day of American Idogs on the North West coast. For more information, contact Dan Ratay at 954-829-3274 . The Middle River Terrace neighborhood’s sixth annual Dog Day in the Park event was scheduled to begin at 11 a.m. this past Sunday, but an early-arriving visitor would have discovered the show was already under way. A 30-foot expanse in the center of the picturesque old park on Dixie Highway, just north of Northeast 13th Street, had been enclosed inside a low fence. A dog obstacle course was set up inside, with low jumping bars and rows of colored cardboard propped up to simulate hoops. A dozen dogs strained their leashes, pacing nervously while tenor yips and baritone woofs filled the air. “This is American Idogs training,” said resident Bill Prigg, sitting outside the fence with his Havanese dog Tammy. “They call it Boot Camp. Obedience training and a little bit more. They’re looking for dog actors to audition for movies and television.” American Idogs is a local company that provides pet entertainment. But Prigg and Tammy were there, he said, just to have something to do together. “Maybe get her a little more training,” he said. Daniel Ratay, Idogs’ producer, strode back and forth inside the fence, speaking into a microphone, instructing owners of a half-dozen small dogs to gather at the far end for the long jump. “This is where dogs do what they love best,” he said. “Jumping and having fun.” But as their owners led them to the jump bars, some of the smaller dogs looked as though they’d rather be any place but here. Others sailed effortlessly over the obstacles. Just after noon, Matt Hensel, president of the sponsoring Middle River Terrace Neighborhood Association, climbed onto a platform to welcome the more than 200 guests – and their dogs – and announced the start of the contests. Jack Seiler, Fort Lauderdale’s new mayor, arrived and took up a clipboard to serve as a judge. One by one, leashed dogs were led to the center of the enclosure for the Best Trick competition. They were to sit up, roll over and hop onto a platform. For many, though, it seemed all too difficult. “Doing these tricks in your living room is one thing,” Ratay said. “Doing them on a stage with other dogs around makes them nervous.” A couple of dogs made it clear, though, that they were not there to kill time. A little Sheltie named Eli ran the obstacle course as though gravity didn’t apply to him. But none had a chance against Chloe, a medium-sized gray dog who ended her ballet by opening a mailbox, removing a newspaper and carrying it to her owner. Be one of our sponsor and increase your customer data bank and exposure.